You'll be £11.99 closer to your next £10.00 credit when you purchase Pirates and Privateers in the 18th Century. What's this? Pirates and Privateers tells the fascinating story of the buccaneers who were the scourge of merchants in the 18th Century. It examines their lifestyle, looking at how the sinking of the Spanish treasure fleet in a storm off the coast of Florida led to a pirate’s gold rush; how the King’s Pardon was a desperate gamble – which paid off – and considers the role of individual island governors, such as Woodes Rogers in the Bahamas, in bringing piracy under control. The book also looks at how piracy has been a popular topic in print, plays, songs and now films, making thieves and murderers into swash-buckling heroes. It also considers the whole question of buried treasure – and gives a lively account of many of the pirates who dominated the so-called ‘Golden Age’ of Piracy. An interesting account of pirates – a surprising number of whom were Scots in real life. 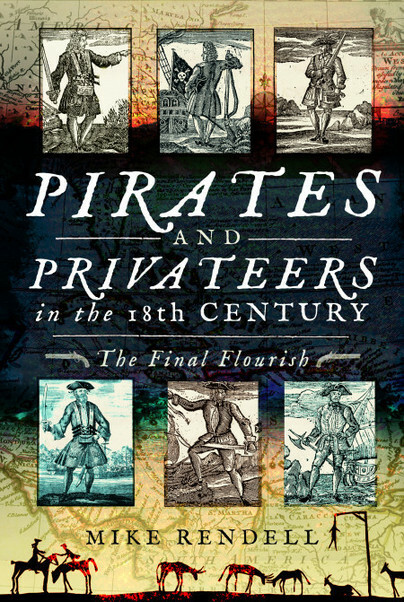 If you have any kind of interest in Pirates or the 18th century then you are going to be held fascinated by this book. It’s really such a treat. The book was very easy to read, the author writes sympathetically but is realistic about the nature of piracy – not heroes but thieves, rapists and murderers – and explores the myths surrounding pirates and their treasures with a keen eye for poppycock. Wow, just wow! This has got to be the best book ever written on Pirates, during the Golden Age of Piracy…all of them! This is certainly not about The Pirates of the Caribbean, a la Disney, but the authentic legends and history. Remarkably researched, this is a quick and informative read! From their origins to Captain Kidd’s buried Treasure, or was there a buried treasure, to the end of the Golden Age to Edward Teach..aka Blackbeard!! I loved this book, it reads almost like fiction, and I wonder what the pirates from the 1700’s would think about our world today! This was an interesting read about the history of pirates and buccaneers. It is an easy read and there is some fascinating facts as well as some well known names. I loved reading about their lives and the honour among thieves that they lived by. This is a superb introduction to what has become known as the Golden Age of Piracy as it assumes that the reader has little or no prior knowledge of the topic. It's written in a casual, accessible manner and although there is a lot of information the book manages to maintain your interest throughout and stops short of being an information dump. I enjoyed this book very much, and found it was pitched perfectly to fill in the gaps in my knowledge of the history of pirates. Overall this is an interesting read, and a good starting point if you are interested in this time period. This is Mike's eighth book, all of them about Georgian England. His interest in the period was inspired by a fascinating cache of papers left by his 18th Century ancestors. He has written a general social history, a story about the founder of the modern circus, an introduction to the Georgians and to the Regency period, as well as books on art-related subjects. He spends his time, when not writing, giving lectures about life in Georgian Britain, both in England and abroad, and on cruise liners. He divides his time between homes in Spain and on the edge of Dartmoor.